Graeme Stevenson and Jennifer King offer their professional take on how to market yourself, and Debee Holland-Olson builds her own website. Artists Linda Roemisch, Suzi Long, & Marti Walker learn the joys of painting as one! 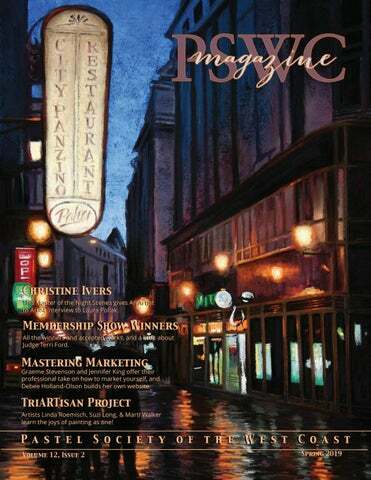 Table of Contents FEATURES SPECIAL SUPPLEMENT Membership Online Show The Interview Christine Ivers sits down with Laura Pollak Tri Artisan Collaboration When Three Work as One-Linda Roemisch, Suzi Long, and Marti Walker Meet the Members Members by the Dozen Mastering Marketing Jennifer King talks about Mistakes Artists can avoid. In Jennifer King, you’ll find a blend of an entrepreneur’s head for business and an artist’s heart for creating. In addition to being a landscape painter, Jennifer has had a long association with art and artists. She is the former editor of International Artist Magazine, The Artist’s Magazine, and several other noted art publications. Fascinated by the business of art, she spent several years working in an art gallery, and she later returned to school to earn a master’s degree in marketing. Today, she brings all of these interests together in her own business, Connect Artist Marketing, which offers personalized marketing services specifically for fine artists. WANT TO GET INVOLVED? There’s always room for more. Let us know what you want to do, and we’lll find a spot for you! KEEP IN TOUCH & FOLLOW US! ABOUT THIS ISSUE Our magazine format was a big hit! This format allows us to add more art and gives readers a PDF version or an online digital version to read on mobile devices. Laura Pollak is an award winning Fine Artist, showing her works in galleries and museums across the nation. Her works have been juried into National and International Shows. Most recently Laura won First Place in the North Carolina Statewide Show. She has garnered acclaim in the very prestigious International Association of Pastel Societies, and the Pastel Journal’s top 100 pastels. Her work has been published along with an interview in the THE PASTEL JOURNAL and in November 2019, will be featured in the book STROKES OF GENIUS available worldwide. Pollak holds a Masters Degree in Fine Arts from Michigan State University with Post Graduate studies from the Center for Creative Studies in Detroit, Michigan. LaVone Sterling, is an internationally published, awarding winning artist, who lives with her husband in Visalia, California. LaVone hails from many generations of artists and musicians Her aunt, Eunice Sargent Johnson, was her first art teacher. Her love of the California landscape and people is evident in her landscape and portrait paintings. LaVone works in oil and pastel. LaVone has a Master’s Degree in Art from California State University, Fresno and is a former community college art instructor. She has studied with Daniel James Keyes; Richard McKinley; Kim Lordier and others. She is a Signature Member of the Pastel Society of America; the Pastel Society of the West Coast and the Alliance of California Artists. This year PSWC is celebrating its 35th year! Founded in 1984, we have achieved so much as a society. Our annual Pastels USA competition represents some of the finest pastelists in the world. Our Online Membership Show, seen online and in this issue of the Magazine, promotes pastels and encourages artists to advance towards elevated membership status. This year we had one of the largest online membership shows in our history. With such a rich and proud history, it is sometimes difficult to make changes at the organization level. Modernization of procedures, elimination of that which no longer serves us, and changes to the very database can be difficult. In 2018, because of the forward thinking of our Board of Directors--Susan Goodmundson, Bonnie Griffith, Jerry Boyd, Dug Waggoner, Deborah Pepin, Cindy Riordan, Russell Frank, and Rita Romero--the PSWC began making changes to our basic organizational systems. The Board took sometime to evaluate the social, financial, and operational aspects of our society and how these issues reconciled with our mission statement. We determined our strengths and weaknesses and made some clear choices about the tools and techniques we would need to move forward and still honor our initials goals and aspirations. One of our biggest issues was having an accurate, reliable, and consistent communication path. Expanding our Regional Representative program helps to bring members together face-to-face, and the addition of new membership database software and a new website has allowed us to offer more to our membership through access to workshop information, a free online gallery for every member and shows online for all to see. With this important aspect of our communication path established, we continued to work on our ever expanding magazine. Our publication division is working on a book on the favorite tips and techniques of some of our best pastelists. When completed, it will be like taking mini-workshops from some of your best friends. We are working in partnership with Terry Ludwig Pastels to create a limited edition 60-piece pastel set that will be available in 2020. We are planning another online show just for our general membership in the Fall 2019, and planning an online fundraising auction in partnership with DailyPaintWorks.com. And weâ&#x20AC;&#x2122;re going to IAPS in June! Whew! We said goodbye to the end of one busy year and hello to the beginning of another busy, wonderful year in the PSWC. We. Are. Pastelists. Twenty pastel portraits by LaVone Sterling, comprised a third of the portraits in a three-woman show titled: “Look At That Face - An Exhibit of Portraiture”, at the Exeter Courthouse Museum and Gallery in Exeter, CA.. The show ran from January 26-March 31, 2019. There was an opening and a closing reception. Both receptions were well attended and LaVone was fortunate in selling two portraits. A reporter from Life Style Magazine attended the second reception and wrote an article reviewing the show. “Chance Encounter” and “Jessie”, two of LaVone’s portraits were included in the article. Lavone was also thrilled to receive notice that her painting “This Path I Am On” was juried into IAPS Pastel World 2019 Exhibition. The reception is June 5, 2019. Bobbye West-Thompson is honored to be awarded 1st Place (see “Breaking 3” below) in the exhibit juried by Dottie Hawthorne, nationally known pastel artist, now living in Portland. 23 American artists are showing 36 works.This is the first annual Spring Exhibit for California Central Coast Pastel Society (3CPS) is now open: Morro Bay Natural History Museum, 20 State Park Rd. April 3 - May 31 Meet the Artists Reception: Saturday, April 6, 1-4PM. to speak. The most ‘way out’ place was on the Wind River Indian Reservation in the middle of Wyoming, where my husband and I raised cattle, horses and hay. I really lived the western lifestyle, and stored away many memories to paint. Memories of cowboys, special cowhorses, wildlife, Native Americans, ornery cows, real and true western family ranchlife, ranch community brandings, cattle drives, Pow Wows and Indian gatherings. Lots of beautiful, wild, open country.. and harsh winters. A lifetime of subject matter from my firsthand living experiences! I hope I am able to share some of these experiences and feelings with you through my artwork...” We can’t wait to work with them! Call for Fall Fund Raisers The PSWC will be working with DailyPaintWorks to host and online auction and fund raiser for our scholartship program. The auction, Mini’s for Education, will take place in October. Artists can enter up to 3 pieces each, no larger than 9”x12” in any medium. Bidding will last over 30 days and winning bids will be split 70% to artists and 30% to PSWC. Proceeds will go to the scholaship fund to empowering new artists at college level and beyond. Details will be available online in July, but start painting now! When our illustrious President, Sabrina Hill, asked for volunteers to interview an artist for the next PSWC magazine edition, I jumped at the chance! And when Sabrina assigned me to Christine Ivers I was elated! Christine’s work has delighted me for years and I was thrilled to have an hour to chat with her! When did you realize you were an artist? When I was in kindergarten it was coming up on Thanksgiving. The assignment was to draw a turkey! I’m sure many of us remember placing our hand on the construction paper, spreading our fingers and drawing around them. When I was done the teacher came over and said to me, “You must be an Artist!” I guess my turkey was better than the other kids, but from that day on I sort of owned it. What was your childhood like? I was born in Bronx and grew up in northern Morris County, New Jersey. My parents were born and raised in New York City, and my dad became head of exhibits and displays for the military. I grew up in very nurturing and creative atmosphere. Featured Interview: Artist to Artist the weather, the day, the colors, and everything that helped him create his work enamored me. What other jobs have you had? MANY! I was a deli waitress, worked in a pharmacy, worked reproducing needlepoint canvases, was head waitress at a fancy nightclub, got my first graphics job in a tech illustration house and finally worked in advertising until 2007 when the economy crashed. That’s when I put a sign out on my front lawn at the office….”Art Lessons”….and moved stuff around in the ad agency that I owned and started to teach. Featured Interview: Artist to Artist the meantime, Claudia had computers but didn’t know how to use them and offered to pay me to teach her. So Claudia was helping me with my painting career and I was teaching her how to use her computers. Over time we now refer to ourselves as sisters by a different Mother. So those two mentors helped me get to where I am today and they’ve taught me things I could never learn from books. By the way, that painting still hangs upstairs in my living room. Do you work exclusively in pastels? Like many other pastellists, I also work in oil. On occasion I dabble in watercolor. And like many other “Pastel Junkies” I’m in love with the immediate gratification and response I get when I’m painting. No waiting for it to dry, not having to clean brushes, and the fact that I can just cover the boxes so that my three crazy cats don’t get into them! But most of all I love that I can correct anything without a problem. Just grab the brush and brush off the mistake! What are your Favorite pastel brands? ALL OF THEM! I was unhappy when NuPastel went to Mexico, but I still use them for cutting edges. The more the merrier and I experiment with anything new. What was your biggest artistic milestone? THE DAY I DISCOVERED PASTELS! We have Pastels Anonymous in my classes. I warn students that they will get hooked. If students buy anything during the week they must come in to class and confess. What type of paper do you use? Do you prep all your own boards? enjoy it so much better than the old world. Do you still take workshops? Yes I do! I like to throw myself out there and see how others think and because having had the Ad Agency I needed to learn how others think. I’ve taken workshops from Susan Ogilvie, Frank Federico, Doug Dawson, Liz Haywood-Sullivan, Tony Alain and many others. confidence to possibly jump to the next competition level. What advice would you give your 20 year old self regarding art? One of the things I would say is to paint as much as you can. Artists learn to see color much more subtly the more you paint in any medium. It’s how I learned about the nuances of temperature and value and all of those basics that you read about in books, but it never makes any real sense until you start actually delving into the fine art of painting. I would also tell myself that it’s okay if I go through a period of stagnation where you wonder if you will ever feel like painting again! The first time I hit one of those “dead” periods I was floored by the fact that I couldn’t face my easel. I sat in a chair at night and watched (or not really) TV shows when I normally would be painting. I did this for three months! Then, all of a sudden, the veil lifted and I started painting again like it never really happened. Now I know there are those periods and I’m not upset when they creep up on me. Usually the fact that I’m faced with a demo pulls me out of it quickly these days, but to a young me it was terrifying. At the end of our conversation Christine was eager to add that her very best work was between her and her husband with their four lovely daughters and their seven grandchildren. Consensus. It’s a word that we don’t usually associate with making art, since most artists work alone. But consensus was the keyword when three PSWC members began working on a single painting. the aspect of creative play and incorporates this into her work once the basics are down. Suzi Long brings a different set of skills to the easel. Her extensive mural experience ranging from cartoons to impressionism cubism and trompe l’oeil makes her a versatile and impressionistic painter especially when working with pastels. She also believes in establishing a strong underpainting often in a complementary color or by using dry pastel with rubbing alcohol. Inspired by the work of Lisa Ober‘s BiArtisan Project, Linda Roemisch, Suzi Long, and Marti Walker decided to take a group art project one step further and make it a TriArtisan project. The BiArtisan Project requires two artists to work on one painting separately, but with communication, collaboration, and cooperation. These three women “What a fantastic project this was. I want to keep going! Beadded a third artist ing the second or third artist gave me a chance to critique the into the mix, effective- piece and put my pastels where my mouth was! I allowed ly turning the game of several days after receiving a piece to examine it mostly for toss into a juggling act. improvement in composition before I added anything. The And they nailed it! most difficult was being first and not knowing how far to go. Membership Online Show Winners BEST IN SHOW Signature/DP The Membership Online Show is one of our favorite events. All the drama of a heated competition featuring some of the best pastelists in the world, with none of the worry over framing and shipping! We are a very fortunate society to have such a strong group of dedicated painters who are willing to put their work out in a competitive environment. Judge Terri Ford, an accomplished artist, mentor, and teacher was this yearâ&#x20AC;&#x2122;s judge. She had her work cut out for her with over 500 paintings to view and judge. Our thanks to her for her keen eye and thoughtful consideration and to you, the artists of the PSWC who entered the show. Members by the Dozen! We connected with a dozen members to give you a taste of artist flavor from around the society!. Each artist was asked three questions, 1.) Is art a hobby or more than a hobby for you? 2.) Have you always been an artist, and when did you start painting? And 3.) What is on your easel right now? (And yes, laundry can be an answer!). Hereâ&#x20AC;&#x2122;s what they told us in their own words! I copied the brown pelican, but it was a neat recognition, nevertheless. I am in the middle of another pet portrait which has become my main focus nowadays. Usually done for fund raising events, I often remain 9 dogs and 3 cats behind. Enthusiasm emerges whenever I begin a pet portrait. However, with each impending portrait, this also brings the slight terror and fear of not quite capturing the personality and spirit of the beloved pet. Those fears are allayed however, when wide grins or tears of joy are received in response to the final rendition. Those are the best rewards that I enjoy receiving over and over again. Joanne Unger much, but once I added pastels to my watercolors, I felt way better able to express myself. Annual workshops with Richard McKinley have added immensely to my knowledge and his encouragement has also been an important factor. Right now, I’m getting ready for an upcoming show in Malibu with my Allied Artist group. Based on a photograph and some smaller plein studies, I’m painting an elongated, 8” x 16” of the Visitor Center at King Gillette Park in Malibu. I have about 10 other pieces that are awaiting varnish and frames. Painting is way more more than a hobby for me. I’ve been painting for 15 years now and hope to continue for the remainder of my life! I’m in a gallery in Laguna Beach, California (Forest and Ocean Gallery) and belong to a couple of local plein air groups including Allied Artists of the Santa Monica Mountains and Seashore and the Laguna Beach Plein Air Society. Both groups provide opportunities to show and sell my work. I also have a studio in Pacific Palisades, California where I work on larger pieces and refine my plein air paintings. Linda Nelson Painting is an avocation for me. Although I am an artisan/creative in several media/forms, painting en plein air painting brings me great joy. Drawing, painting, illustration, sewing, fine jewelry, Medieval cooking, Pastry, Landscape and Green Garden design all fight for time in my week. At my insistence, my Grand Uncle Charles would carry me to visit the horses at the paddock at the end of our street. I believe that horses and animals were my first subject matter. Later in life, I became a Natural Scientific Illustrator then taught K-12 students comparative animal anatomy in small after-school classes. I started watercolor painting in college, oils in 2004, pastels around 2007. wash. The subject matter is sunset-lit storm clouds raining over a California mountain range. On what’s on her easel: Hahahahaha! I’ve bit off more than I can chew. I’ve got an 18 x 24” sheet Linda is the current president of Pastel Society of of Wallis paper, which has had a pastel & alcohol the Gold Coast. Marianne Harris Art started out as a hobby, but has since become my career. Some time ago, I asked the owner of the dog agility facility where I compete with my two dogs if I could paint her dog in pastel. I had recently taken a workshop from Lesley Harrison, who has become my good friend and mentor, and I wanted to try my new skills out with a dog other than my own. I gave the painting as a thank-you gift for providing a wonderful place to play agility with our dogs. The painting received a lot of attention and before long I had a long list of commissions to create. Two years later I quit my daytime graphics job and became a full time artist. Marianne Harris, with Sierra and Dakota. I spent 30 years in the graphic arts field...so if that counts as being an artist, then yes. I drew horses as a kid, but that disappeared after elementary school. Somewhere around 2003 my husband Pat, suggested I take a drawing class, which woke the beast inside me. I started getting serious with fine art in 2010 after getting an AA in Fine Art, as well as attending workshops. I love painting animals of all kinds, including dogs, horses and, lately, wildlife. I Just finished a dog commission that will be shipped to Connecticut, and getting ready to start another commission. I have a long list of future paintings that I’m anxious to get to, and many of my past dog commission clients have been getting puppies! I’m always happy to work on more commissions. Left: 30 Years Wise, a Portrait of Picasso, 14” x 14” pastel on velour, photo reference by Scott Wilson, used with permission. Note: Marianne recently published her book “Puppies! Featuring the Pastel Art of Marianne Harris”. Twenty-one paintings of puppies complimented with a notable dog quote. Available on Amazon. Redlands, California. She belongs to the Redlands Art Association, and The Pastel Society of America. In answering the questions, Olga said, “I started to paint as a hobby while my children where small, after discovering pastels, my painting flourished, and I became a full-time artist. Now is not a hobby anymore is my passion I guess I have always been an artist at heart. I have always had an interest in the arts and I always been inspired by visiting museums of art. At the age of 26 I started painting in my spare time and I never dreamed to become an artist. I knew I had a passion When I started to get up at 3:00 am to paint. My easel has my new creation of art. paintings. This way I felt I had a better connection to what inspired me to paint. I try to paint more towards realism. But that’s not all what I do. I paint what inspires me and can be any subjects. Vicki Brink I’ve been a professional off and on for over 30 years, since a little after the time I discovered pastels. There were years with less activity, but once you try to convince those tax guys that you’re serious, you can’t slack off for too long! Does the parakeet drawing on our fridge count? I was about five I think. My mom was my first oil painting teacher and that was in my teenage years. I’m a fourth generation artist. I have paintings by my mom (oils and watercolor) and one by my grandmother in pastel! And I have a small box of my grandmother’s pastels from Paris (the pastels, not the grandmother). I’ve tried just about every medium over the years, but discovered pastels in the early 80s and haven’t looked back since. There are currently five easels in my studio and I wish I had room for more! Currently there’s one close up of foxgloves, another one of one of my grand nieces and four landscapes. Yes, that’s more than five. I keep moving them around. That’s why I need more easels! can do for yourself is to shift your mindset. Read on to discover seven important concepts that will help you move forward on your journey. art? Do you think you’re doing everything you can to promote yourself as an artist, but you’re just not seeing results? Or maybe you’re fairly satisfied, but you wonder if you could be doing better? As a virtual marketing assistant to artists, I’m always studying how artists market themselves, and I’ve noticed some simple mistakes that many artists make. So now you’re probably wondering if your lackluster results are the result of making one or more of these marketing errors, aren’t you? Great! Read on to discover seven of the most common mistakes and how to fix them. all-important preliminary step of marketing and rush headlong into seeking opportunities to sell, only to fail. So what is marketing? I define it simply: Marketing means building awareness of you and your work. That’s it. Marketing involves a whole slew of faceto-face and online activities that get your name and examples of what you do in front of the eyes of people who may be interested in your work. For an artist, marketing messages say, “This is who I am, and this is what I do.” Through your marketing efforts, you invite people to enter into the life of an artist—your artist’s life. Done right, marketing allows you to authentically connect with people who want to support you because they like and admire what you do, which will hopefully result in sales and other valuable opportunities. Ideas to Consider: This mistake is easy to fix. Now that you know what marketing really means, you can just relax into it. Understand that marketing is something you must do to reap sales eventually, but that it won’t involve bragging or using hard-sell tactics. if they can just land gallery representation, they won’t have to “waste” time on marketing themselves anymore. The galleries will do all the promotional work, plus handle all the sales. Let me address why this is untrue. Let’s say you’ve been fortunate enough to be accepted into one or more “good” galleries. Chances are good that you’ll be one of 40, 60, or even 80 other artists represented there. How much promotion do you think your gallery will give you as an individual? Truthfully, not much. There simply isn’t enough time in the day for your gallery’s staff to promote each one of their artists, which might mean you’re getting less attention than you deserve. So really, your only option is to supplement what your galleries do for you with your own marketing efforts. Yes, of course, when you have a healthy relationship with your galleries, you should encourage collectors to purchase through them, but you should always continue to promote yourself. (Again, marketing is a separate, preliminary function before sales.) Ideas to Consider: Just like Mistake #1, resolving this issue is a simple mind shift. No matter where you are in your career, accept that you must take control of your marketing by handling it yourself. Don’t rely on gallery representatives to do it all for you. your work. The sum total of all this is your brand, and in fact, it’s normal and desirable to have many facets to your brand. Mastering Marketing two-part process that means a) making initial contact and b) nurturing and building relationships with those people who fall into your target audience as described in Mistake Solution #4. Through networking, you will build a fan base of people who not only buy your artwork but introduce you to others who become fans as well. Fortunately for us, we now have two arenas where we can network: in face-to-face settings, such as shows, fairs, meetings, and parties, and on the Internet through blogs and social media. Networking and talking about your art is essential, but it is also admittedly time-consuming. That’s why you want to get the most bang for your buck. Be smart about the time and energy you invest in networking. Ideas to Consider: First, make contact by networking in places where you are most likely to encounter people from your target audience. Go after exhibition opportunities specifically geared toward your kind of work because the attendants already like that style or genre. Participate in group activities where the other group members fit your profile of an ideal collector (age, gender, income level, etc). Online, identify the blogs read by your target audience and the social media platforms used by your target audience. (If you’re not sure, pick Facebook and/or Instagram.) In both arenas, interact with people and let them know who you are and what type of work you do. Then, regularly invite people to visit your website and give you their email addresses so you can build relationships with them. Yes, you can and should continue to interact with your social media contacts, but you also want to build and maintain a list of email contacts so that you can send them monthly e-newsletters that you use to share new work, highlight upcoming shows, or announce your successes. The most important thing to remember is that every message you send out is an opportunity to build a closer bond with your fans. Let them know more about who you are and what you’re doing with your art. Welcome them into your world, and always make them feel like special guests at your party. ter every single one, only those that are most likely to accept your work. Start locally and grow into regional and national exhibitions, and establish a monthly budget for entry fees and shipping costs. Mastering Marketing Mistake #7: Not developing a sustainable, strategic plan for marketing your art. Food for Thought: There are many reasons why some artists don’t market their own work, but if you’re not, you’ve got to find a way around it, whatever the reason. If you want to achieve any kind of success in selling your art, you first have to build awareness. You need a strategic plan that you can easily implement day in and day out. all, your expertise is in making art, not in marketing. Instead, consider the ideas for improvement I’ve offered here, and take heart in knowing you can get better at art marketing as you move forward. ***************** In Jennifer King, you’ll find a blend of an entrepreneur’s head for business and an artist’s heart for creating. In addition to being a landscape painter, Jennifer has had a long association with art and artists. She is the former editor of International Artist Magazine, The Artist’s Magazine, and several other noted art publications. Fascinated by the business of art, she spent several years working in an art gallery, and she later returned to school to earn a master’s degree in marketing. Today, she brings all of these interests together in her own business, Connect Artist Marketing, which offers personalized marketing services specifically for fine artists. To learn more, visit ConnectArtistMarketing.com. Tell us about your marketing successes (or failures). Where have you found success in marketing your art. Contact the Magazine to share your story with the Sociey! Art in Motion Making a Video as a Recorded Legacy and a Marketing Tool If you haven’t heard of Graeme Stevenson yet, you’re about to get acquainted with this dynamic artist and filmmaker from Australia. I found his work while scrolling through YouTube about five years ago. I wanted something to watch while I was on the treadmill when I landed on a series of short videos about artists in Australia and New Zealand. Each video introduced a talented artist their studio, explored their art and life philosophy ,and demonstrated some of the tricks or techniques that the artist used to create their art. What could be more interesting to walk to? The one hour walk flew by, and I was HOOKED! I couldn’t get enough of these wonderful mini-movies. Imagine my delight when I discovered that there were hundreds of them. I began reading up on this series which airs on public television in Australia. record, a video of them would be a way to capture their techniques and their art and preserve it for future generations. With little movie making experience, he decided to go back to college (at age 51) to get a degree in filmmaking. In one of the first classes, the final project was to complete a short two to three minute film about a topic of interest. He completed six 24 minute videos about artists he knew and the techniques that they employed to create their art. He got an “A” for the class and the beginning of a television series. Working with the vision “To build a library of the minds of artists; to preserve a digital record of creative spirit, culture and techniques for future generations.” He created “Put Some Colour In Your Life.” Now, nearly a decade later, his shows are seen in thirteen countries, and he has film crews in seven countries including the United States. Millions of people are now Graeme on his Famous Bike familiar with his famous motorcycle ride along a quiet Australia road to his next destination, with his trademark voice over, “G’Day Viewers, I’d like to invite you to join me on a journey of creativity, learning, and adventure...” He is currently working on putting together a film crew for artists in India. Art in Motion tastical creatures from his imagination and the old folklores of his ancestors using natural materials is his forte. In the episode, Garth used a chain saw to carve a porcupine’s body out of a huge log. Then he made quills from clay which were fired and glued into dozen of holes he had drilled into the log body. The result was whimsical, bold, and beautiful. The episode shows us where the artist works and how he picks his materials and prepares for a project. And it demonstrates how critical it is to have a digital record of work for the sake of history. Garth’s work and other artists like him might be lost to the world without these videos. the need for an art forum became more evident. The Colour in Your Life website has been expanded to have a positive impact for artists by providing a Facebook-like community for artists to share, speak their minds, and have access to all the videos. There are also “Bucket List” art workshops offered throughout Australia with amazing artists designed for those who have “seeing Australia” on their bucket list! Art in Motion your own or have one made for you by a production company. Creating a video with an iPhone, SmartPhone or digital camera is one way to capture your art. There is software like Adobe Premiere that can help you edit your film, add narration and music, cut in still shots of your work, and polish it into a finished product. You will probably need to have some assitance (and assistants) to capture the angles and lighting to get all the shots needed. Narration can be done after the final edit--be sure to prepare a script. Once your video is complete, post it on your website and social media for maximum exposure. Putting Some Colour in YOUR Life For those who are more comfortable in front of an easel than behind a camera, consider having a production company make a video for you. Grame’s company is surprisingly affordable with videos starting at $6,000 . Here’s how Colour in Your Life videos work: 1. Apply online for a spot. 2. Be contacted by the show for film crew availability and dates. Go to www.colourinyourlife.com.au for more information on productions, workshops, and the art forum. We will be creating a website for Debee Holland-Olson. Debee is an amazing artist, but she’s never had time to set up a website. I caught up with Debee while she was babysitting her grandson in Florida. Her home-away-from-home office was a laptop under a palm tree on the beach. Even though I’m in sunny California, I was jealous. The first step in creating a website is to determine what your skill level is and how much time you wish to devote to website upkeep. I have found that FASO.com offers a wide range of templates and one of the easiest platforms available to build and mauntain your own website. There are lots of features that you can incorporate such as a blog, shopping cart, newsletter, and multiple galleries. After discussing Debee‘s goals, we determined that FASO. com would be a good fit for her. ing story with a little bit of personal history and perspective. It’s a way to let people get to know you a little bit. And it makes art investors feel like they understand you a little better which turns them from fans to buyers. Note: A blog is not mandatory for a website; however, it is a great way to attract traffic to your site. This is important if you were making sales or trying to promote your work in a gallery or your workshops. The more activity your website has such as the number of views of your blog with comments, the higher your website will rank in a Google search. Analytics. This is the data that tells you who is coming to your website, when, how often, and from where. At the beginning, there’s not much to see, but over time, this information can help you plan where to market and who to market to. Ranking. Who’s number one? Ranking will tell you. And it will tell you where you are on Google and other search engines like Bing and Yahoo. This matters down the road, but not in the early life of your website. A 250 to 300-word artist biography. Your artist bio which is also referred to as an artist statement should be a little bit about your history, but mostly be about your artistic inspiration, perspective, and mission. It’s a good idea to include an interesting tidbit about yourself, for example you juggle to relax or you know how to yodel, etc. tag, and horse is a good tag, and horse racing, horses running, painting of horses, pastel painting of horses, horse painting—these are other search words that could be entered by someone looking for a horse painting. I find that there are certain words I try to tag consistently like pastel painting, pastels, impressionistic and so on. Once all this information is loaded onto the website, we will manage SEO, SSL, and all the BACK END stuff that will help you track how you’re doing. Mastering Marketing First Step: Adding your images into your portfolio of work. You will need dimensions of the work, price to sell if (if you want to), title and materials. You can upload multiple images, but once in your portfolio list, you willl need to add title, and all the other information. You will also have to categorize the images--Landscapes, Portraits, By the Sea, however you like. This will help sort them on the FRONT FACING webpage. When your current images are uploaded, you are ready to move to the home dashboard again. Second Step: Add image and tag line to home page. From the Home dashboard go to Website Home Page. Select an image from you portfolio list, add a tag line and save. Third Step: Enter you infomation in “ABOUT THE ARTIST” page. This is where you will add an interesting but SHORT biography of your life as an artist. Years ago, after reading my first bio, a consultant once told me, “No one cares this much about your life.” She was not wrong. Keep it short and sweet with one fun fact. Add Contact Information. This is usually a form that has been created by FASO. Add newsletter- I think newsletters are a great idea, but they are a big commitment. Give yourself a break and wait on this one until you are more secure in the website. Fifth Step: Well, you’re done. Go to the dashboard and click Preview. That’s your NEW WEBSITE! Yay! Mastering Marketing Debee is an amazing artist, and she had been thinking about a website for a long time. It was fun to work on this project together, and she did a wonderful job. Many of you may see yourself in her answers below. Take heart, Debee did it and so can you! Check out her site at https://debeeholland-olsonfineart.com I asked Debee a few questions about her experience. Here are her thoughts. What prevented you from building a web site sooner? My fear of the “high speed techno computer world” and “messing things up, loosing stuff”, prevented me from building a website sooner. I have lived in a rural area of Extreme Northern California for some time now and sometimes being in an isolated area prevents one from the pursuit of new avenues. I did not grow up in the era of technology but had some basic skills in Word and use of Social network. Twenty years ago, my husband and son offered to help build a site, the results did not sync with the Fine Art world. Viewers and patrons were not able to interact with the site and they were unable to purchase or leave messages. It was usually a Saturday morning ordeal of programing for hours and usually ended up being an ugly experience, so I just gave up and decided maybe I should just paint and omit the tech world. I knew I needed a website, I was missing out on a lot of exhibition opportunities and potential clients. 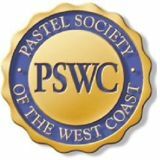 Fast forward to March 2019,I was contacted by Pastel Society of the West Coast, editor Sabrina Hill, to see if she could be my coach to develop a website and, yes, I was willing to be coached and would be happy to dive into a web project with her! What was the most important thing to you about having a website? Most important for me, was the ability to have more exposure of my artwork and paintings to the world. To reach more people and have a way for people to see new work, in my distinct style I produced and be able to have a way to communicate with them was also a high priority. I also knew that websites were often checked as a backup source by jurors if you are applying for professional art societies or for shows and Plein Air paint out events. So being able to launch a website would strengthen opportunities for me. How did working on it feel? Was it more or less complicated than you thought? As I began this challenge with my coach, I was very nervous and did not want to fail by my lack of knowledge of tech terms and functions. I was put at ease with my first phone session as Coach Sabrina provided a list of items to prep before we went to a provider that would host the website. The homework was not in any way overwhelming so I was able to complete the task list and look at sites that were up Debee’s Florida Office and running to host artists. I picked FASO Fine Art Studio Online and the domain name, debeeholland-olsonfineart.com. What guidance or advice was the most helpful? The encouragement from my coach, that “I could so this,” empowered me to forge ahead to complete each task. In our second coaching session, we explored the whole home page to make entries from my prep and homework notes. As I logged onto my home page at FASO the prompts were instructive and easy to follow, I entered the information and became more confident as each page was completed. I am still entering and making adjustments, but I am extremely happy with the website and love the way it’s turning out. Mastering Marketing Do you feel confident about maintaining your new website? My confidence has soared as my skills for entering new work and information about new events has become easier. My email list is growing as viewers sign on for my newsletter, and I am developing a weekly blog. It is fun to check website traffic to see the statistics on views and read comments viewers have made. I have recently purchased a new camera and have continued with the challenge of taking better photos of my work and sizing the photos to create original files and sized files for digital entries to juried shows. In addition, I purchased a new laptop so I can make changes to the website and use it for just my art business. I have learned so much over a few weeksâ&#x20AC;&#x2122; time. I appreciate all the info My coach has provided me with to get the website up and running. Now I feel confident enough to pay it forward as I can help another artist dive into making a website to promote their work. Thank You, Sabrina for all your help. This was a very fun project! A sketch done in Debeeâ&#x20AC;&#x2122;s Florida office! Blocking in Local Color the water. As I sketched the scene where the creek broke away from the main flow, I noted a sparkle in a soft ripple. I decided that area would be the focal point for my painting. I wrote notes in the margins around the sketch for later reference. I canâ&#x20AC;&#x2122;t emphasis enough the need to prepare before an artist begins a painting. As seen in the photos of my thumbnails, I have made notes and generated a road map that I used to create the finished painting. In my sketches I have established basic values and the time of day. I simplified complicated shapes and the relationship of negative space around the shapes. It was late in the day. This set the stage for color temperature and harmony. I decided to place the area of focus on the light reflecting off the water in the river. This ignited a feeling of warmth and peacefulness. The light for a portrait or still life is an unseen source in the finished painting. However in a landscape painting, the sky is the source of light as well as part of the subject in the painting. Therefore the sky is going to be the lightest light and the reflected light on the water, a close second. I took this into consideration in my notes and on my â&#x20AC;&#x153;road mapâ&#x20AC;? Using my thumbnail sketch, I transferred the drawing onto UArt 400g mounted paper. With Terri Ludwig soft pastels, I blocked in local colors. I used a shade or two darker than I would later use for the finished painting. I used a cool blue to block in the upper area of the sky. I over-layed this with a warm pink. I used a very light turquoise to warm up the lower portion of the sky, again over-laying with pink. Then, using a flat, nylon brush and denatured alcohol I wet the flat shapes. I did not wet the sky. Now using a seasponge, which I tore into ragged shapes, I sponged the alcohol over the trees, rolling it for a leaf-like look and feathered edges. The alcohol dried quickly and once it had, I began applying a variety of soft pastels. explore the finishing touches that turn paintings into personal statements. Dates: July 15-19, 2019 Level: All Levels Join Rita for the Ultimate Summer Art Vacation - an all-inclusive 5-day Art Retreat at The Abbey of the Hills, in the heart of the glacial lakes region of South Dakota. Immerse yourself in the tranquility of this former monastery while stimulating your creativity with a Rita Kirkman Pastel Workshop! The 5-day workshop will give you plenty of time to exercise and improve your pastel abilities (all skill levels welcome) in the classroom, while leaving extra hours to explore the beautiful grounds, paint outside, sketch and take photos, or simply relax! Learn from Rita’s 40+ years of experience with pastel. Lots of individual attention given. One price includes the workshop tuition, on-site lodging and daily home-cooked meals! Class times: 9:00am–4:00pm Tuition: $450 Level: All Levels Class Limit: 15 Get ready to explore the California coast with award winning artist Aaron Schuerr. Find “the story” in the landscape and paint it in a way that is direct, simple, fresh, and honest. Engage in fun exercises designed to focus on value, color, and shape. From that foundation, you’ll explore edges, atmospheric perspective, color and shape relationships, composition, and mood. Most importantly you’ll learn to paint with greater intention. Through demonstrations, group discussions, composition walks, painting exercises, and plenty of individual instruction, you will learn to approach the landscape in enthusiasm and confidence. This workshop is open to pastel and oil, but the focus will be on pastel work. Be sure to look for Aaron Schuerr’s selection of landscape pastels from Jack Richeson & Company. Eighty gorgeous colors--have Aaron sign the box at class! correct values, plus much more. PSWC HOUSEKEEPING Here’s a Bit of News for Members & Information on New Members NEW WAYS & MEANS CHAIR & PASTELS USA CHAIR Pat Stoddard Aragon has agreed to be our new Ways & Means Chair. Call her if you have any ideas for sponsorship or awards for our shows! Jan Miller will be taking the reins ( and reign!) of PASTELS USA from Jerry Botd. We appreciate the efforts of these and all our volunteers. ship. As one of the largest Pastel Societies in the United States, we are proud to have such talented, diverse and active artists in our group. One of the best ways to support a healthy society is to bring in new members. There are lots of good reasons to join. If you have artist-friends who are not members, now’s the time to invite them to join. Contact Debbie Pepin if you have questions or would like more information. VOLUNTEERS NEEDED Members, we need your other talents, too! We have lots of opportunities for volunteers from working on the PASTELS USA Show to hosting Paint-outs. Please contact Sabrina Hill for more information.